Ambrosia and Iron: Tear it up! Time for a new "Take It, Make It" challenge over on the Craft Stamper blog. This time around we're being inspired by Helen Chilton's Terrific Tearing article which is on page 78 of the May issue. Don't worry if you haven't got hold of it yet, the challenge is open for a couple of months so there's plenty of time to play along. 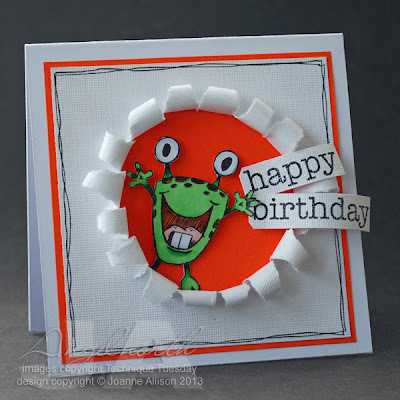 I immediately had the idea of something bursting out of the card when I saw this technique so I ran with that and made a kids' birthday card with this cute monster and some bright colours. I used a textured white cardstock for just a touch of extra interest on the torn layer and added a simple doodled border as it seemed to fit the character of this little chap! His eye stalks are raised up on foam pads and his feet are stuck to the card so he does have some movement as if he's coming out of the frame. 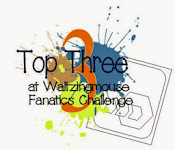 There were some great entries for the first challenge - don't forget the winning entry will be published in a future issue of the magazine so if you fancy seeing yourself in print, why not join us?! There's a lovely stamp from sponsors Indigo Blu for the winner as well. All the challenge details are here. love it - the graphic design and bold colours are spot on. This is so cute, and you did a great job with the tears! A really fun card. I am sure the youngster who receives it will love it. This is such fun! Wish I had a kid to make this for! A great fun card Joanne. Love the monster bursting out:) Shall have to get my thinking cap on! Joanne you have produced a fantastic card there. I love how the little monster is leaping from the card. Lovely card - whoever gets it must get a happy smile on the face - gorgeous frog!